An update to the original outlook has been issued as morning model guidance suggest a higher probability of severe weather is expected across the S Alpine region later this afternoon and evening hours. 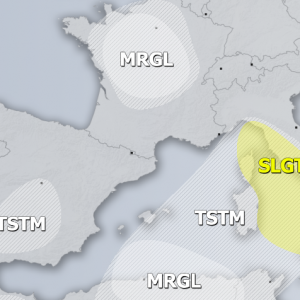 A MDT risk has been issued for extreme NE Italy, NNW Slovenia into S Austria where improved conditions are seen on the local high-resolution models. Various models are simulating an enhanced threat for training convective cells extending across the western part of the risk area which should lead into an excessive rainfall threat, as well as a lot of hail accumulation in places. 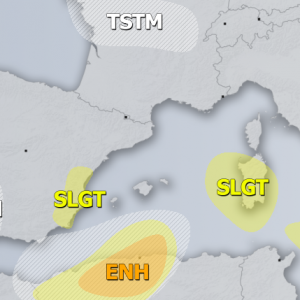 More than 100mm could result with the maintaining storms which will be fueled by high moisture from the N Adriatic region as well as strong lift associated with an approaching wave. Heavy orographic rainfall will also be an additional source for excessive rainfall threat. Further east into SE Austria and NE Slovenia, a bit higher threat for isolated very large hail warrants an upgrade as well. 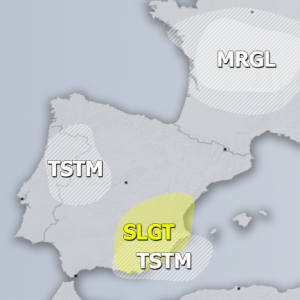 In addition to rain and hail threat, likelihood of one or two larger MCS clusters possible along the SSE-wards moving cold front in the evening. This should enhance a severe winds threat as well, especially if some bowing segments form with the more discrete supercells along the leading edge of the MCS. Please refer to the original outlook for the other risk areas details.